Budhia was born in 2002 and set the world record in 2006 . He is the only world's runner who completed the marathon race at the age of 4 . By doing this, he got listed his name in Limca Book of World Records. Know more Interesting facts about this amazing runner. Budhia is the youngest marathon runner in the world. At the age of 4 , Budhia set the record of running 65 kms in seven hours and two minutes. By the age 4 , Budhia had participated in 48 marathons and completed them as well. In 2006 , he was listed as World's Youngest Marathon Runner in the Limca Book of Records . After his birth , his mother sold him to passing peddler for merely 800 rupees. Later Biranchi Das paid the money to peddler and took him back and admitted him to orphanage . Biranchi Das came to know about Budhia's potential when he punished him by making him run .Biranchi forgot about the punishment and went away.When he came back after 5 hrs , he saw Budhia was still running. His Heart was found normal even after running for hours. That made Biranchi to train him for marathons . Budhia was featured in the Documentary called Marathon Boy made by HBO and BBC storyville which was nominated for an EMMY Awards . Budhia's Coach Biranchi Das was murdered in 2008 . After that Budhia lost his track and still seeking for some support . Last but not the least , The epic one. Budhia is suffering from malnutrition in Govt. Hostel . Indian Govt. do not bother to look after this talented racer. 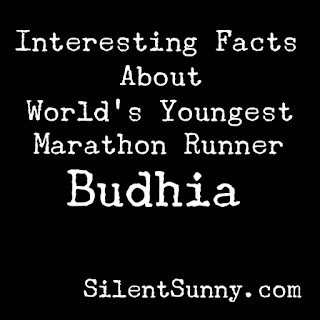 So much thanks for reading this list of Interesting facts about Marathon Runner Budhia . Please share this with your friends and do comment and tell your views.